Canals, Chats and Charm – Run. Ride. Roam. Time to move on from the charm and gorgeousness of Bath, which I did reluctantly because I really liked it and would loved to have stayed on a bit longer. Oh well, on we go and at least we actually left in sunshine! We rode through the city streets again, downhill this time! 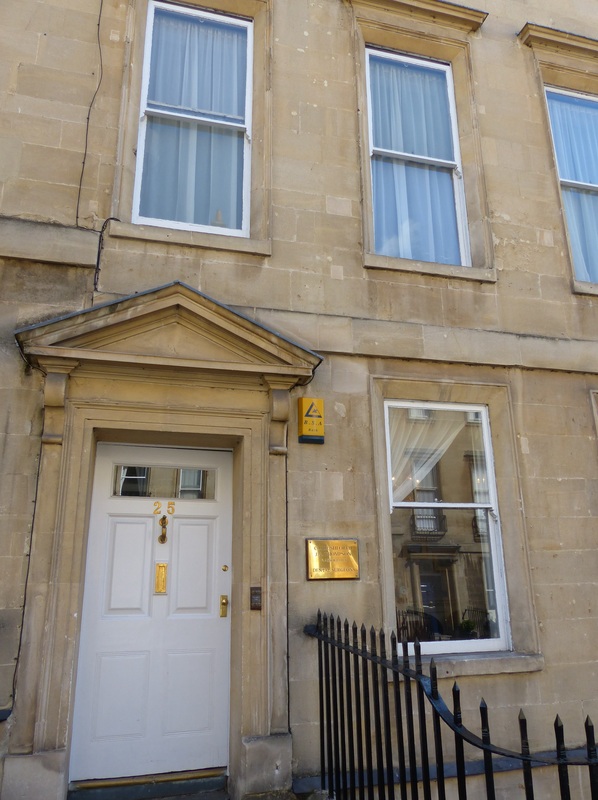 We passed by Jane Austen’s house, who lived in Bath for four years and her novels, Persuasion and Northanger Abbey are both set in the city. 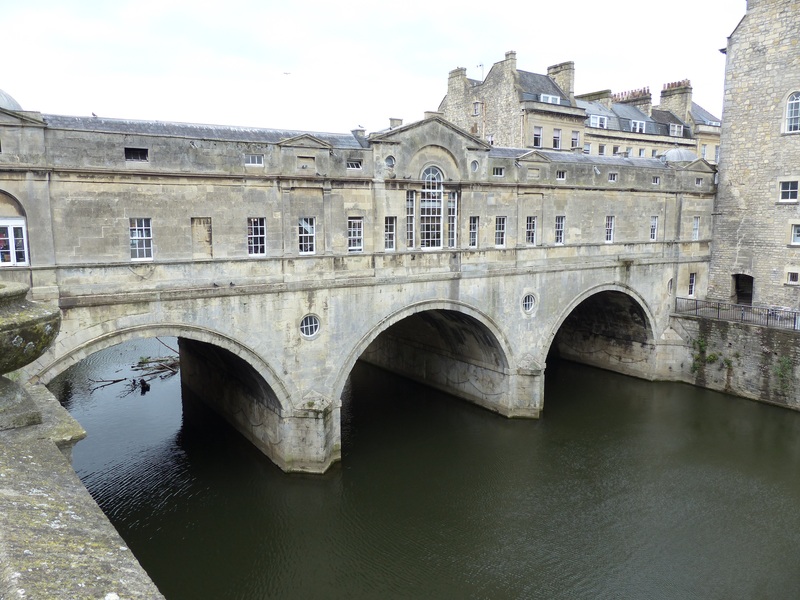 Then we rode over Pulteney Bridge, which is styled similarly to the Rialto Bridge in Venice and the Ponte Vecchio in Florence and is a wide bridge, just like a town street, lined with shops. 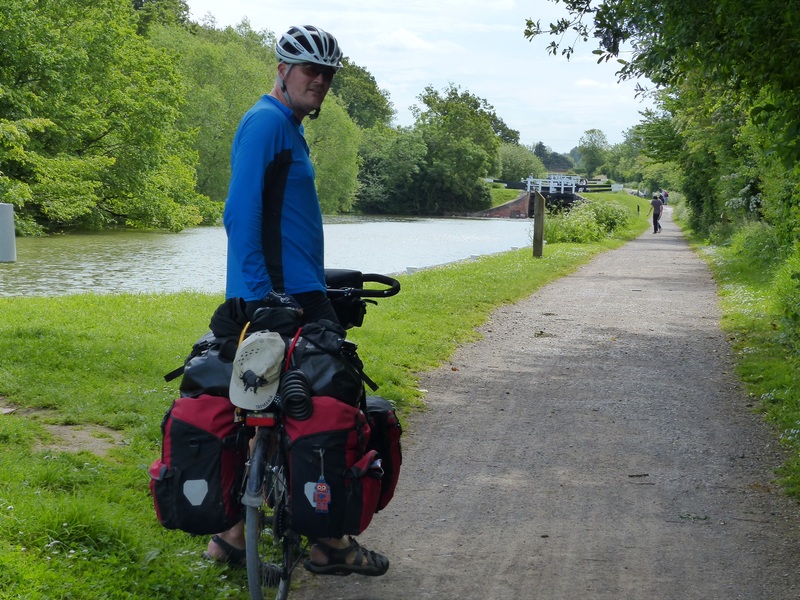 We made our way to the cycle route which would take us along a canal path and that’s more or less how we spent the day…hugging the canal and at times we had the Avon River down below us. 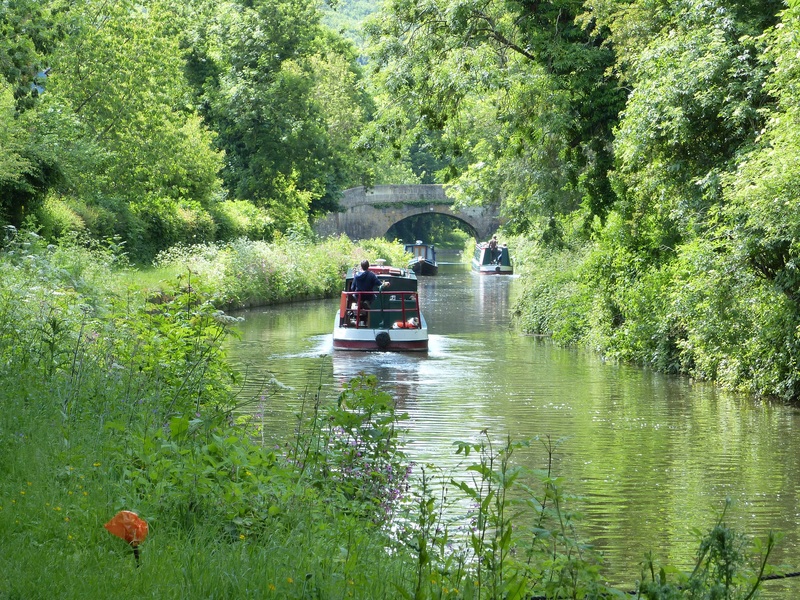 It was a lovely ride by the water, with dozens of narrow boats slowly and silently making their way along the canal – that’s another fantastic way to “slow travel” I reckon, just peacefully chugging along and watching the scenery go by. We did the same thing, pedalling along and taking in the scenery of the canal with the fields beyond and the cottages alongside the water. 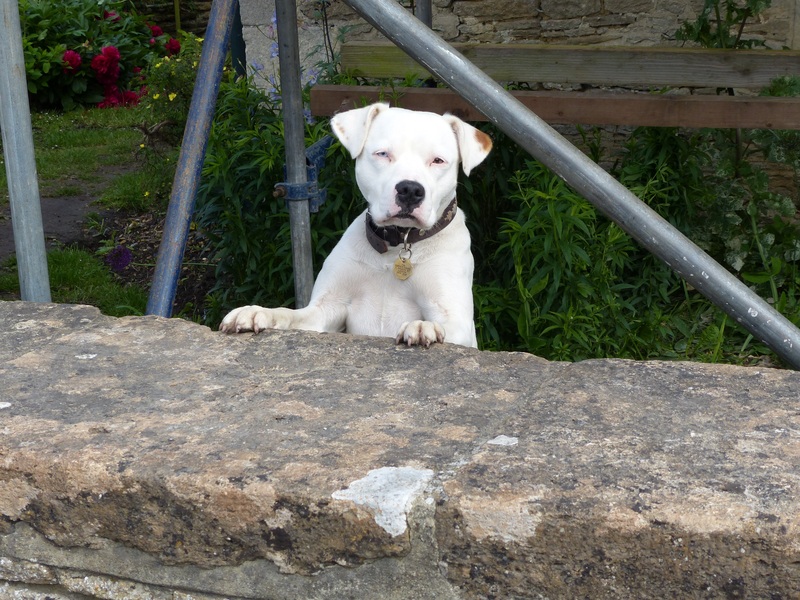 I did learn something as we went though…here’s a tip for you…do not ride along a canal with your mouth open! If you have to breathe, use the nasal passages only! I think I managed to spit out most of the bugs, but there were a lot of them and every time I opened my mouth there seemed to be another one lined up and waiting to enter! 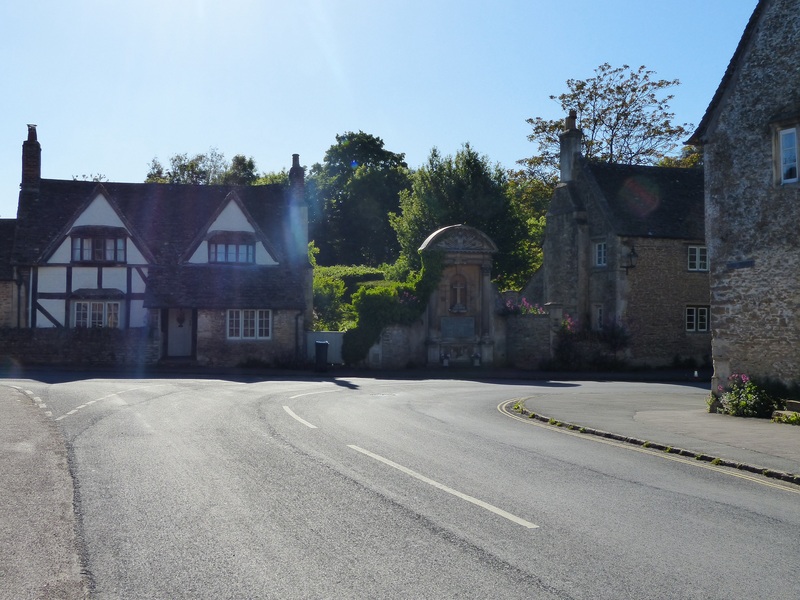 We rode into the town of Bradford-on-Avon and stopped in a park for a late elevenses. 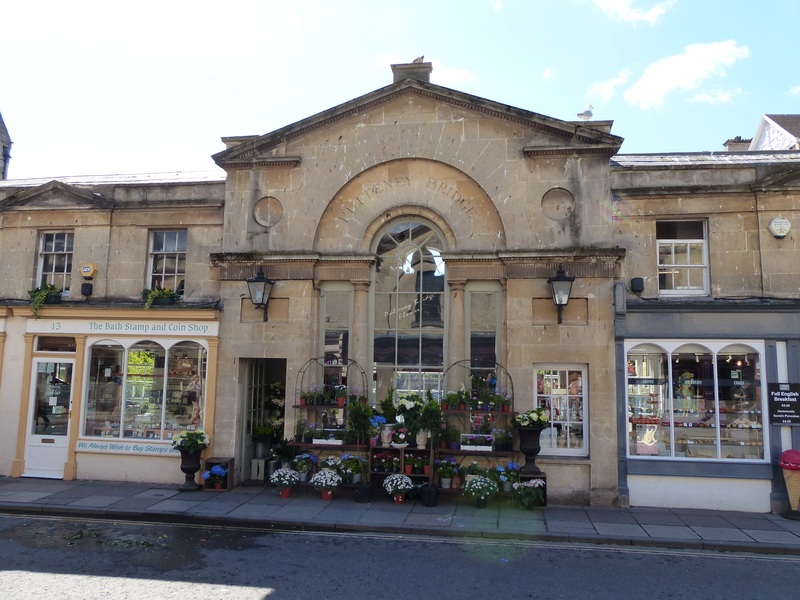 It was another busy, but charming town, with lovely old houses and stone buildings. 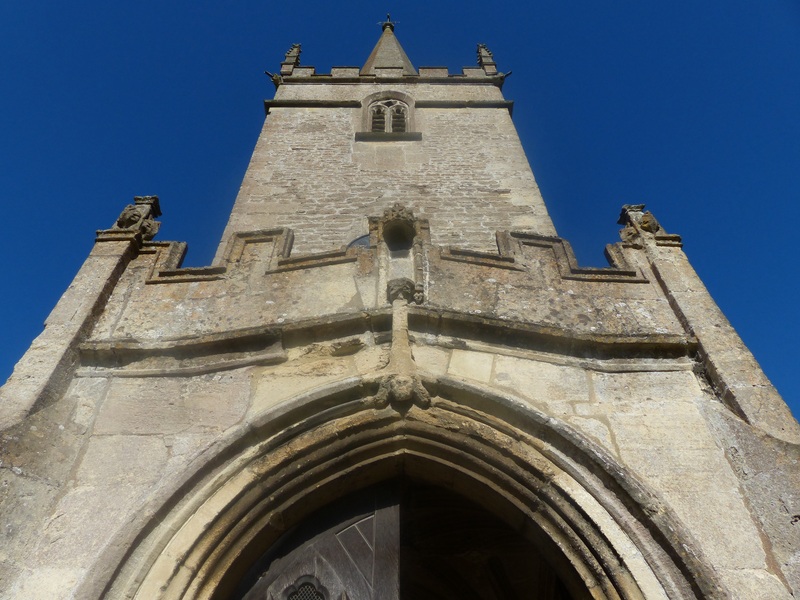 We also crossed counties again and we’re now in the county of Wiltshire. As we were sitting in the park, a man on a recumbent bike rode past and stopped to comment on our bikes. “Not out for a short ride then!” he said. “No!” we replied and told him about the trip. He said he’d owned a couple of bike shops in Bath and now restores old and vintage bikes. He mentioned some places and asked if we’d been to them and where we were heading. I asked him about his recumbent bike because we’ve passed a couple of them and I’ve always wondered about riding them up hills. “How is it going up hills on the recumbent bike?” I asked. “Hard work!” came the swift reply. He said one of the hardest things is just keeping his feet on the pedals and stopping them sliding off when he’s uphill, since his legs are out in front of him. I hadn’t thought of that problem! We chatted for a while and I was again struck by the chattiness and friendliness of the people we’ve met in England. The people that come up and talk to us all adopt a “I’m settling in for a chat” stance. They either lean on something, or fold their arms and take on a stance that says, “I’m settling in, I’m ready to chat for a while and I’m getting comfortable.” People here just take the time to stop and talk and pass the time of day or ask questions or tell you a bit about themselves or their life and they’re in no rush. It’s great! At home I think the difference is, people always seem so busy and rushed, so even when they stop to chat it’s like they’re poised, ready for escape. They don’t adopt the “I’m settling in for a chat” stance, they take on the “I’m going to stop and be polite and chat for a second, but I’m going to leave as soon as I can because my life is so terribly busy and I’m so rushed” stance! I much prefer the English approach and position for chatting! We had another man come and talk to us too and he told us he’d done the Land’s End to John O’ Groats ride and then told us about a man who’s on the road at the moment trying to break the record for the most miles cycled in a year. It was 80 000 or something like that. “I don’t think we’ll challenge that record!” I said. So we had another pleasant sit in a park in a charming town and had a chat to some locals. Delightful! As we rode along the canal, whenever we had people in front of us we would either honk our horns from a distance, to give people time to notice us, or we’d loudly say “hello” as we came up behind them, to alert them to us. I did though, come across a walker in front of me that I couldn’t alert and I think he was hearing impaired…it was a hearing impaired squirrel! The little fella was hopping along the path and I could see him ahead of me and I was gaining on him. As I came up behind him, he didn’t take evasive action at all, but just kept hopping along the path. I slowed right down and ended up riding right behind him. He stopped. I stopped. He sat right at my front wheel and made no attempt to move, so I sat and watched him and waited until he was ready to leave the path. He eventually turned and spotted me and swiftly headed for the undergrowth! It took him a while though! He was quite happy in a little squirrel world of his own! Sorry I burst his blissful bubble! I then saw another little squirrel but this one high-tailed it into the grass as soon as he saw me. He shot out in front of me, suddenly saw the approaching “squirrel squashing wheels” and made a mighty swift about-turn and headed back into the grass. I think I saw the “Aaaah” look on his face when he saw me! We rode into the busy town of Melksham and stopped on a picnic table beside a bowling green, to have lunch. No one was playing, so no lunch time sporting entertainment from the ladies and gentlemen in white, but it was a pleasant spot for lunch. I think this sign outside a cafe says it all about English summer weather! “Of course!” I said. Ha ha, funny man. 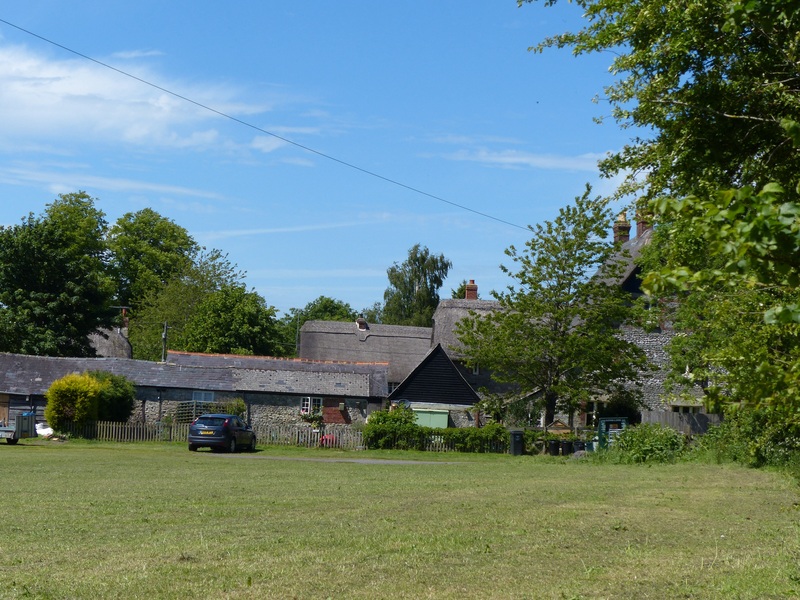 After pitching the tent and having a cuppa in the sun, we went for a stroll into the village. Lacock is a National Trust village and the whole place has been kept as it was hundreds of years ago. 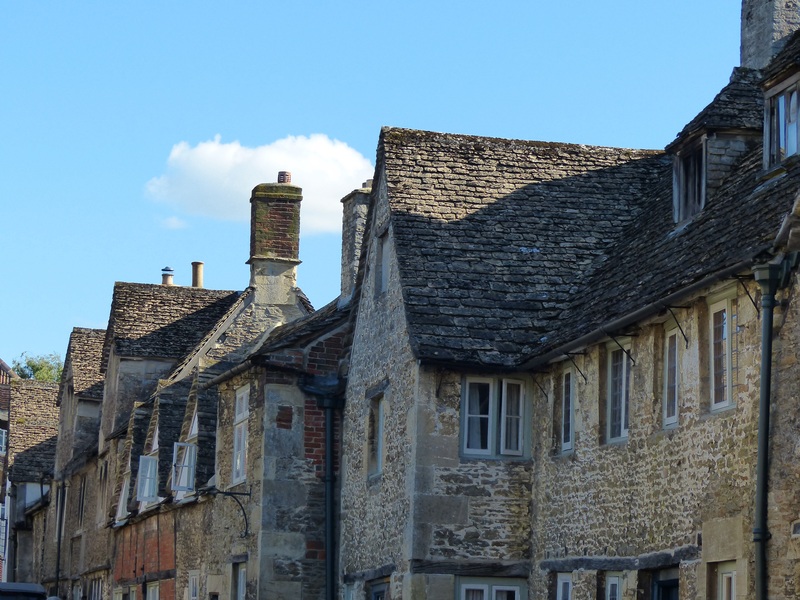 It’s like a village that’s paused in time and the buildings and houses are all original and no developments or additions are allowed to be made to any building or any part of the village. It’s a charming little village. It’s also been used for a number of TV shows and movies, like the TV series Cranford that starred Judi Dench. 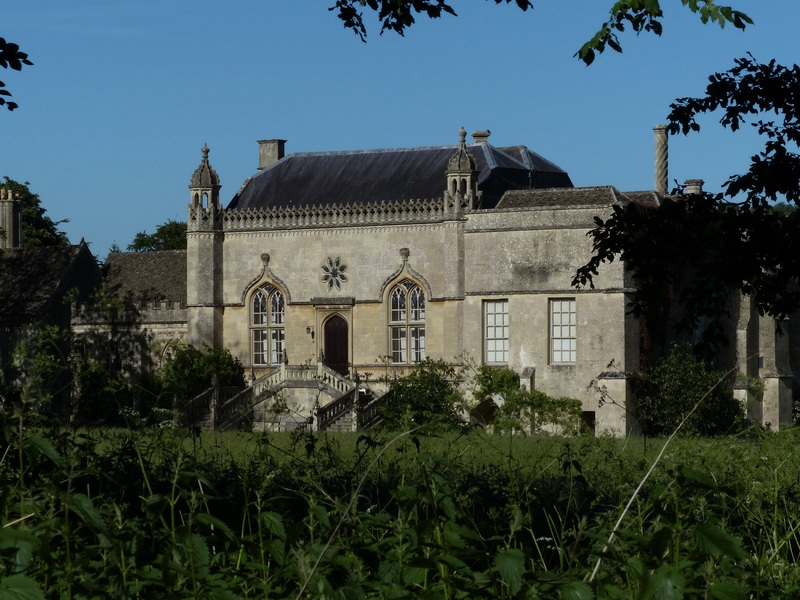 Harry Potter was also filmed here and Pride and Prejudice. We had a leisurely stroll around and then wandered back to camp to fire up the little Trangia and cook ourselves some nosh. Should the pugs be offended? 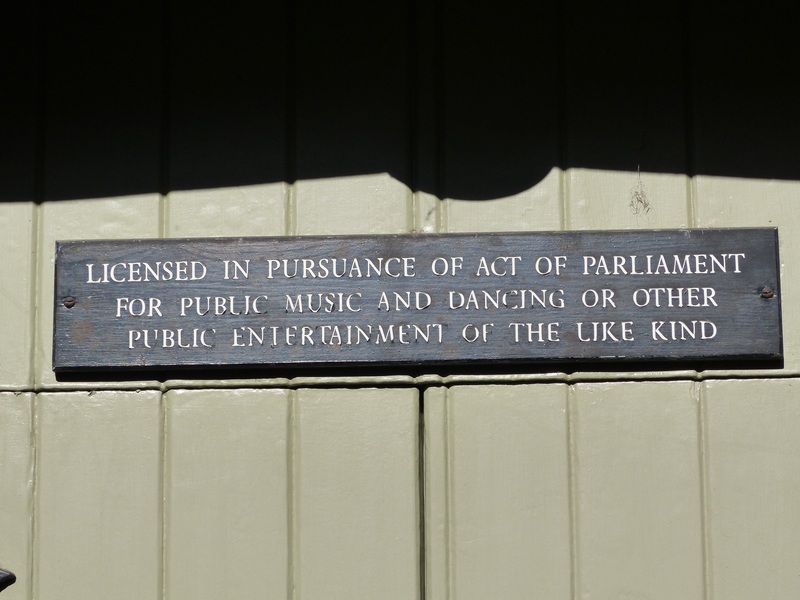 An 18th century night club? It was a gentle day. A leisurely day. An easy and pleasant day. 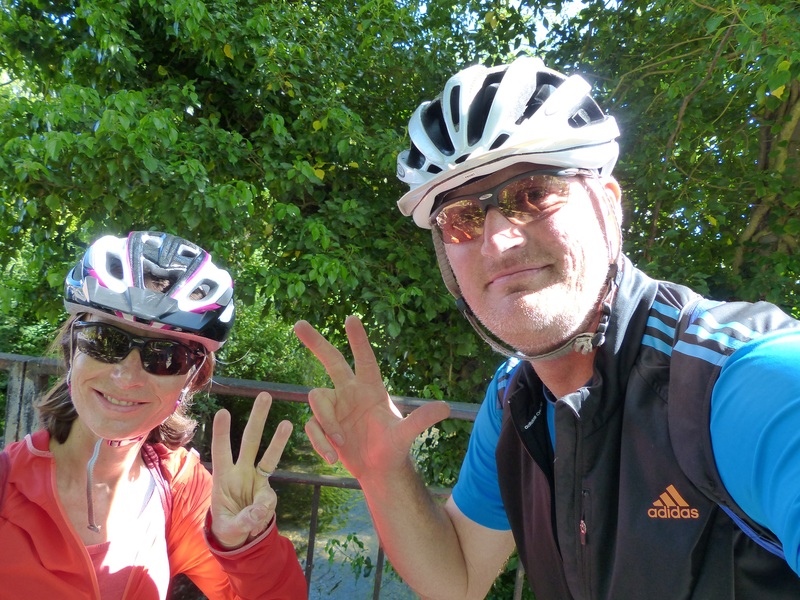 We only rode 41km, it was along a flat canal, the sun shone and we just puttered along in no hurry and no rush. That’s the way to travel! We saw some charming villages and towns, chatted to some friendly and interesting people and enjoyed the scenery and serenity of the canal. Lovely. Delightful. I won’t say I’m loving it, because I probably need to change that record, but you know what…I might have to keep playing that record a little longer! It’s a favourite tune! Today there were two records set. First, we had another sunny day! Woo-hoo!!! The first time we’ve had two days in a row of sunny weather since we’ve been in England! By the end of the day I’d even go so far as to say it was hot! It was a ripper day! The second record was our 3000th kilometre. Then I’d passed by and didn’t hear where he was off to in his smart suit. 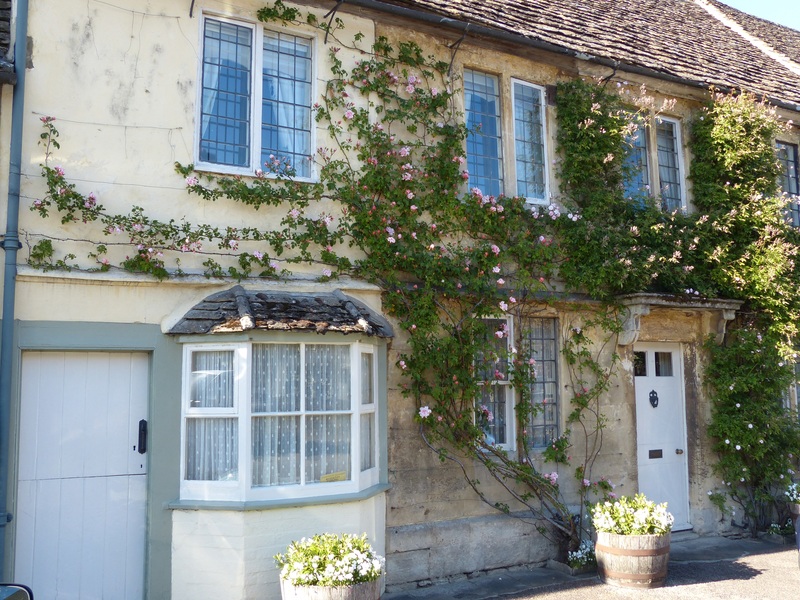 It was such a wonderfully classic English village scene and I pedalled on with a huge smile on my face. As we were riding out of the village and on to the main road, an older man on a rickety bike rode past us and gave us a huge smile and a wave. That just made my already grinning face, grin all the wider! We rode along the canal path again and it was such a gorgeous scene in the sun, with all the boats. We exchanged waves and good mornings with everyone we passed and it was a very cheery and friendly ride! Quite a few people we passed commented on the load I was carrying, saying I was carrying more than Steve and I had a bigger load! I laughed, but I think Steve was getting a bit miffed! My favourite comment was, “Aye lass, you’ve got more gear than him!” Friendly, wonderful people! We rode through Devizes so we could see the famous Caen Hill Locks. 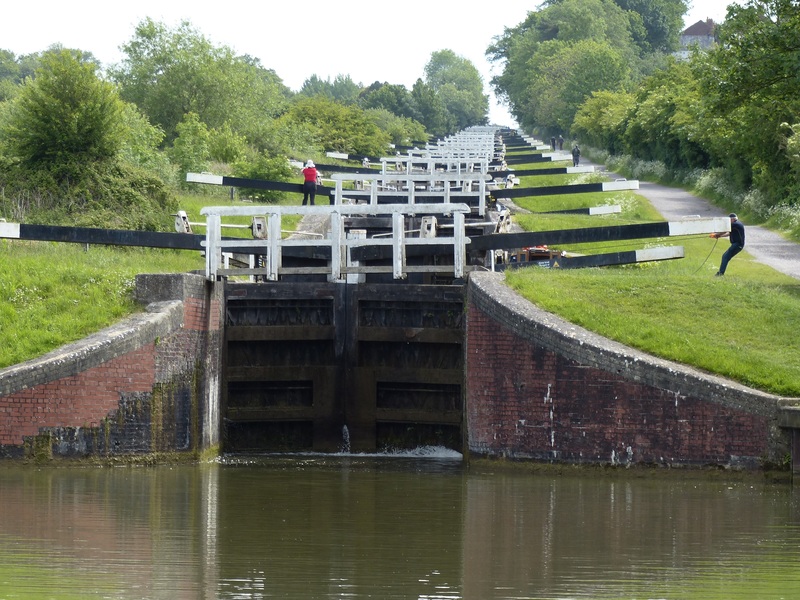 They were built in 1810 and are a series of 16 locks going up Caen Hill. When the designer John Rennie came upon the hill, while the Kennet and Avon Canal was being developed, he designed this ingenious series of locks to enable boats to travel up the hill. Amazing! So clever! They are a Scheduled Ancient Monument and have the same level of protection as Stonehenge. The locks marked the end of our canal route, so we were back on the country roads and up some hills. 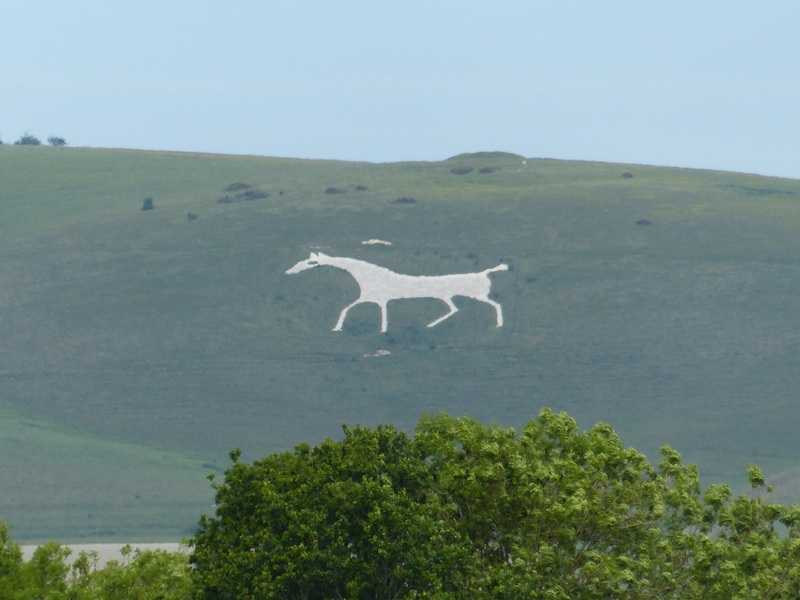 We had a good view of the white horses cut into the hillsides and nice views across the fields and valleys. We stopped at a cafe for a cup of tea and to consult the map and find a campsite nearby, then pedalled on to find one of my favourite campsites so far. We are pitched in a field behind a pub in the tiny little village of Wilcot, near Pewsey. 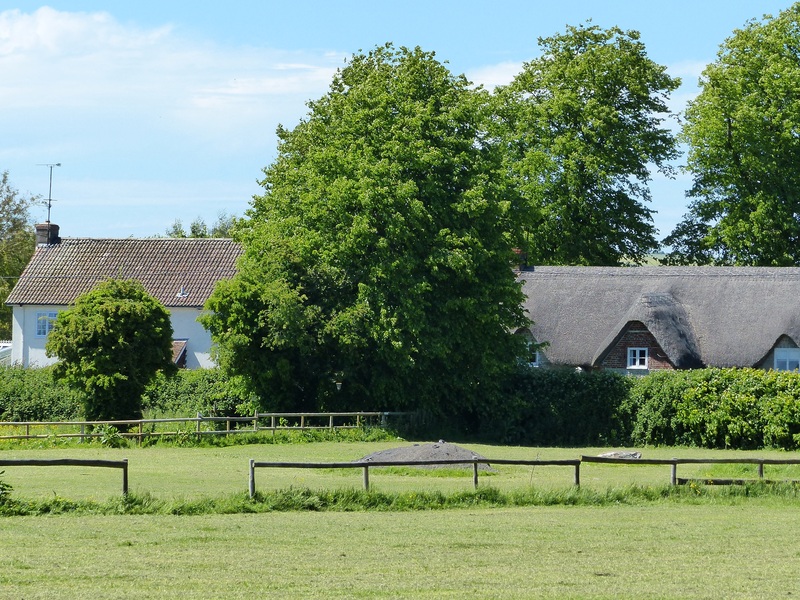 The village just has a row of houses and a pub and that’s about it and we are set up in the back field, looking across at thatched cottages and the old pub and across the fields. It’s absolutely magic! 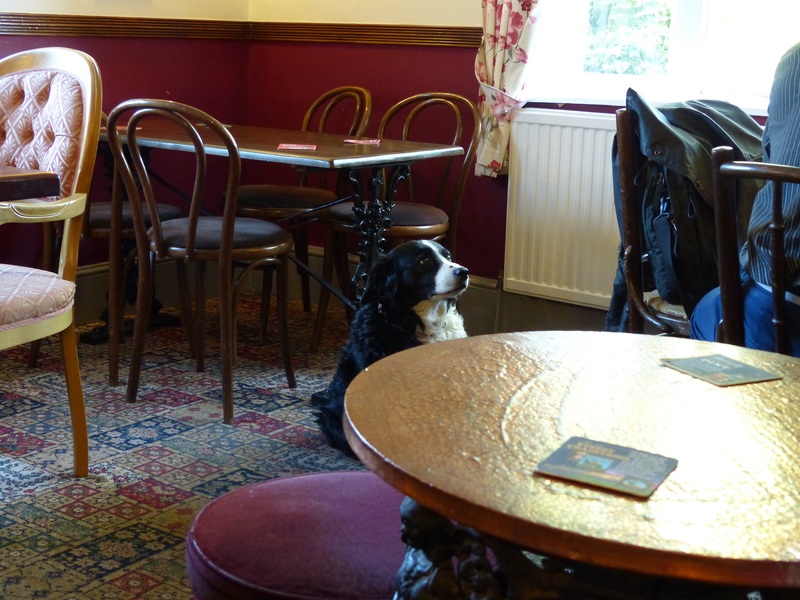 There’s no wifi, but the pub had some, so I’m posting the blog at a table in the pub and the pub Border Collie has just strolled in and is giving a man at the next table the stare down, hoping he’ll share some of the meal he’s eating. No luck so far! We have nothing to offer, so the collie gave us a tail wag and a look and moved on, looking for better pickings! Another great day. Sunshine and charming village life. I’m such a village person, that every village experience just adds to the enjoyment and my cup runneth over with delight! I’m just smilin’ a darn big smile! We’re Not in the Village Anymore Toto! 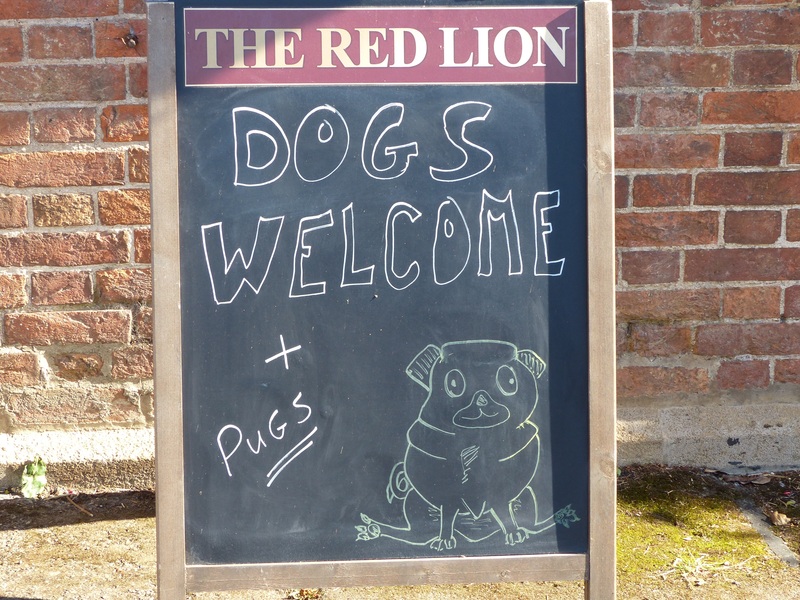 Love the dog sign. Poor pugs. Must have been put there by another dog. 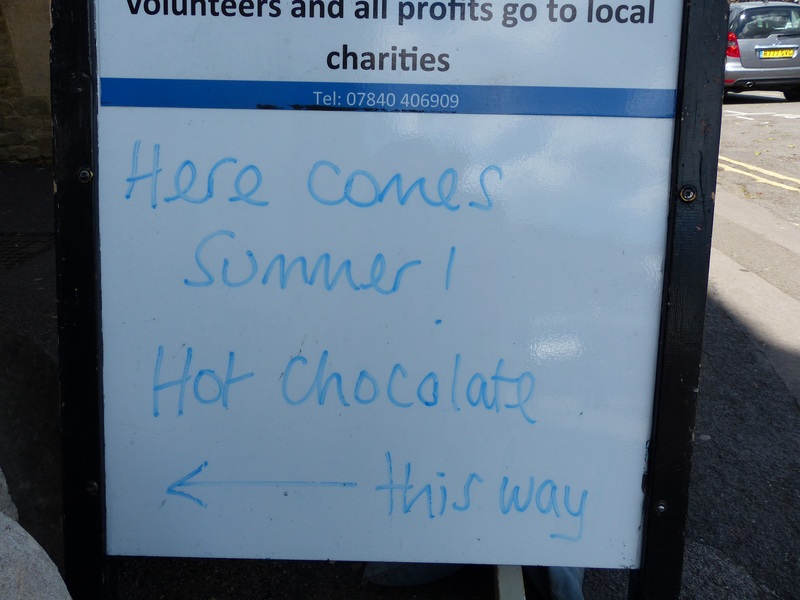 The sign about the weather (and hot chocolate) was a good one too. Ha ha, yes the sign was probably put there by a poodle! We’ve seen some good signs around, they make us smile!